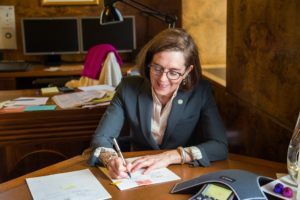 Governor Kate Brown will be in Bend on Monday to sign a transportation package into law. The deal will provide funding for the planned Cooley Road interchange to help relieve congestion on Highway 97 on the north side of Bend. It also funds major projects and routine road maintenance statewide. Governor Brown will be near the intersection of Cooley and 97, at the north end of Nels Anderson Road across from Lowe’s, at 11am Monday morning for a ceremonial signing. Bend is one of five stops the governor is scheduled to make across the state as she signs this deal into law. The Governor will next travel to Bend, where congestion along U.S. 97 has been a significant challenge for both residents and freight-dependent businesses in the region. To address congestion problems, the Bend area will receive $50 million from the transportation package to improve U.S. 97. Improvements at the Cooley Road intersection in Bend will also allow the city to continue development at Juniper Ridge, a key business and freight hub in the area. In addition to traffic improvements along U.S. 97 in Bend, HB 2017 designates funding to improve safety on U.S. 97 in the Terrebonne area and includes $4.2 million a year for public transit in Deschutes County. Deschutes County Republican, Knute Buehler, has declared his intent to run for governor against Kate Brown. Buehler voted against the transportation package. Bill signing, Governor Kate Brown, Transportation. Bookmark.